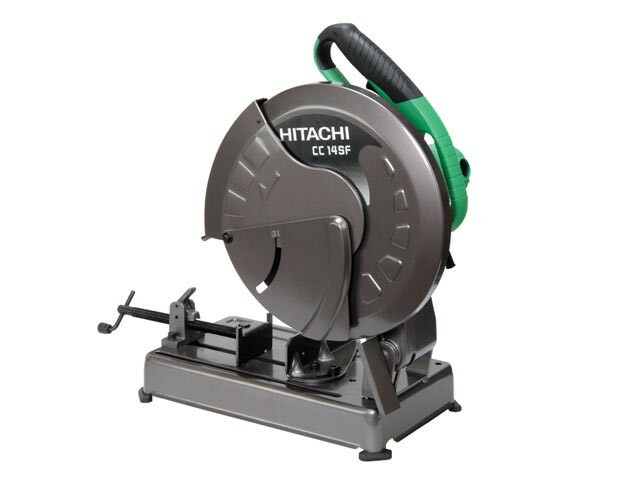 The Hitachi CC14 SF Cut Off Saw has a powerful motor for heavy-duty applications with a sturdy aluminium housing for extended service life. It has externally accessible carbon brushes for easy service and maintenance. One touch vice system allows quick feeding and easy tightening and cutting. The saw is also fitted with a spindle lock, that makes mounding and dismounting wheels more convenient. The soft grip handle provides added user comfort and there is a spark diversion guard for user safety. Supplied wih: 1 x Cut-Off Wheel and 1 x Wrench. Capacity: Round Pipe: 115mm, Shaped Steel: 115 x 130mm. Wheel: 355mm x 25.4mm bore.